Who doesn’t remember the pokemon soundtracks... or even better, the first Final Fantasy soundtracks? We all know the “sound quality” was terrible, but we still all loved it. 8-bit music is amazing, end of story. I found some wannabe pokemon theme songs, or just some wannabe 8-bit songs. The first track is from Electrixx and uses the Tetr is soundtrack, but just to make us think it’s an 8-bit song. At one point it plays (the original), but it changes to some hard-ish house beat (you’ll understand what I mean if you DARE listening to it). 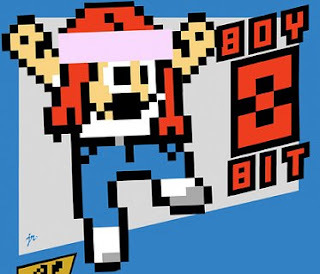 The second track is from an emerging artist, Boy 8-Bit. I really like his work, it’s unique. I would call it “light oldschool electro”. It isn’t some hard beats to dance to, but has a certain feel to it, making it enjoyable. It’ll probably make you happy if you’re in the right mood. At least it works for me, hah. This is my personal favourite right now, KNOW WHAT I’M SAYIN’?! I want my music box, and my gf. I posted another song that could fit in this “8-Bit” style that you can find here. It’s Lykke Li – Little Bit (Death to the Throne Re-remix). Oh well. I really like that one too. What the hell, I like every track I post. Yeah, whatever. Has no real link with 8-Bit music but I felt like posting it anyways, it's another "relax" song, but with (guess what!!!!?) more groove. Listen to the lyrics around 4:00. This entry was posted on Saturday, September 12, 2009 and is filed under Boy 8-Bit,Death to the Throne,Electrixx,Lykke Li,Nari and Milani,Unconditiona. You can follow any responses to this entry through the RSS 2.0. You can leave a response.